The basic idea of cognitive behavioral therapy is that your thinking determines your quality of life. If you change your thinking, you will improve your life. External factors influence your life to some degree, but it is mostly how you interpret external factors that has the greatest impact. If you think that you have to be perfect, small disappointments will feel like major failures. If you dwell on your worries or fears, you will eventually feel overwhelmed. If you hold on to disappointments or resentments, you will sap the joy out of life. How you choose to interpret events, and your ability to reframe them is the power of mind over mood. Ask your therapist or doctor if cognitive therapy is right for you. These techniques can complement the work you do with your therapist or doctor, but they are best done in combination with professional guidance. Negative thinking is thinking that leads to negative consequences. It based on false beliefs or on a few selective facts, and it ignores important facts that would lead to better consequences. Negative thinking is usually rigid, absolute, and not supported by most of the facts. When your thinking is rigid and absolute, you tend to take an all-or-nothing approach and you are resistant to change. For example, you may think that you are a failure at everything, and you may be resistant to hearing encouraging advice from your friends. Sometimes it’s hard to recognize negative thinking. You may only recognize that your life isn’t working. Cognitive therapy is designed to help you recognize your negative thinking and discover healthier thinking patterns. These are the common types of negative thinking. There is some overlap among them, and sometimes a thought can involve more than one type of negative thinking. Dwelling on the Past: "If I dwell on why I'm unhappy and what went wrong, maybe I’ll feel better." Pessimism: "Life is a struggle. I don't think we are meant to be happy. I don't trust people who are happy. If something good happens in my life, I usually have to pay for it with something bad." Negative thinking is learned thinking. You weren’t born thinking this way. You probably learned it by watching the people around you. If you see important people in your life using negative thinking, it will start to seem normal. You won’t question if it is healthy or not. You won’t even question where it came from. It will feel like you’ve always thought that way. Negative thinking turns into automatic thinking through repetition. By the time you are independent enough to do your own thinking, you may have been exposed to numerous examples of negative thinking. By then, negative thinking feels like just part of who you are. Without even questioning it, you automatically assume that you are wrong, or a failure, or disliked. Automatic thinking is helpful in everyday life, because you have so many minor decisions to make that you can’t take time to ponder every choice. It allows you to navigate life efficiently. But automatic thinking is unhelpful if your assumptions are false. If you have absorbed a negative way of thinking, then you will often come to wrong the conclusions without even knowing why. What you have learned you can unlearn and relearn something new in its place. This is the value of cognitive behavioral therapy. You can learn new life skills and new ways of thinking that will lead to a better life. The consequences of negative thinking are cumulative. One negative thought piled on top of another starts to take a toll on how you view yourself and your future. Here are some examples. If you think that any mistake is a failure, this all-or-nothing thinking can lead to anxiety. You worry that any mistake may expose you to criticism or judgment. Therefore you don’t give yourself permission to relax and let down your guard. If you think that you are broken, unfixable, or unlikeable, this negative self-labelling can lead to depression. You are trapped by your own unrealistic view of yourself. Feeling trapped is one of the common causes of depression. Negative thinking that can lead to anxiety or depression can also lead to addiction, because anxiety and depression feel so uncomfortable that you may turn to drugs or alcohol to escape. Negative thinking not only leads to unhappiness, it is also an obstacle to self-change. When you think in an all-or-nothing way, then the idea of change feels like an overwhelming challenge. You can’t see the small steps, and you don’t have the energy to take big steps, therefore you feel stuck. 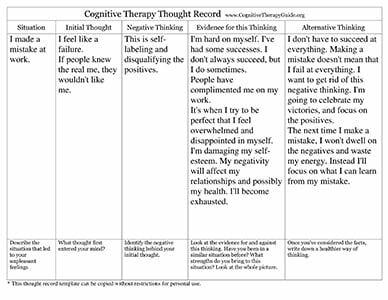 A CBT worksheet (also called a thought record) helps you think about your thinking. It is the basic tool of cognitive therapy. It is a series of questions that lead you step-by-step through the process of identifying your negative thinking and changing it. 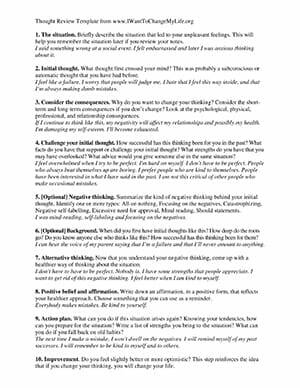 A CBT worksheet gives you a chance to reflect on your thinking after the fact, when you’re not reacting out of fear or anger, so that it’s easier to identify negative thinking. A thought record helps you see that your negative thoughts are based on false and untested beliefs. For example, you may believe that you are a failure because you were told you were a failure growing up. You may believe it even though other people consider you successful or may praise your work. This is a classic example of an untested belief. You haven’t stopped to challenge thinking that you learned at an early age. CBT worksheets (thought records) help you find healthier ways of interpreting the facts. You couldn’t see these alternative ways before, because they disagreed with your childhood beliefs. You can change your thinking. Once you realize that you can change it and get into the habit of challenging your thinking, you will begin to change your life. Here is an online pdf version of a CBT worksheet (thought record template) and a webpage version that you can print without restrictions. 1. The situation. Briefly describe the situation that led to your unpleasant feelings. This will help you remember the situation later if you review your notes. 2. Initial thought. What thought first crossed your mind? This was probably a subconscious or automatic thought that you have had before. Steps 1-3 help you identify what you need to change and give you the motivation to change. 4. Challenge your initial thought. How successful has this thinking been for you in the past? What facts do you have that support or challenge your initial thought? What strengths do you have that you may be overlooking? What advice would you give someone else in the same situation? 5. [Optional] Negative thinking. Summarize the kind of negative thinking behind your initial thought. Identify one or more of the basic types of negative thinking, for example all-or-nothing, focusing on the negatives, catastrophizing, or negative self-labelling. 6. [Optional] Background. When did you first have initial thoughts like this? How deep do the roots go? Do you know anyone else who thinks like this? How successful has this thinking been for them? Steps 4-6 help you see that your negative thinking is not based on facts, but is driven by false beliefs that you have probably learned. 7. Alternative thinking. Now that you understand your negative thinking, how could you have handled the situation differently? Drop any negative assumptions, and think of possibilities or facts that you may have overlooked. 8. Positive belief and affirmation. Write down an affirmation, in a positive form, that reflects your healthier approach. Choose something that you can use as a reminder. Steps 7-8 help you come up with healthier ways of thinking and crystalize them into an affirmation. 9. Action plan. What can you do if this situation arises again? How can you prepare for the situation? Write a list of strengths you bring to the situation? Knowing your tendencies, what can you do if you fall back on old habits? 10. Improvement. Do you feel slightly better or more optimistic? This step reinforces the idea that if you change your thinking, you will change your life. Steps 9-10 help you incorporate your new thinking into your life. Cognitive behavioral therapy is effective because it takes you step-by-step through the process of self-change. I said something wrong at a social event. I felt embarrassed and later I felt anxious thinking about it. I feel like a failure. I worry that people will judge me. I hate that I feel this way, and that I’m always making dumb mistakes. 3. Consider the consequences. Why do you want to change this thinking? What will be the consequences if you don’t change? Look at the psychological, physical, professional, and relationship consequences. If I continue to think like this, and beat myself up, I will feel miserable. My negativity might affect my relationships and possibly my health. If I continue to think I’m a failure, I will lose my self-respect and start to act like a failure. I feel overwhelmed when I try to be perfect.I'm hard on myself. I don't have to be perfect. People who always beat themselves up are boring. I prefer people who are kind to themselves.Other people make mistakes and it’s not a big deal. I am not this critical of them. 5. [Optional] Negative thinking. Summarize the kind of negative thinking behind your initial thought. Identify one or more of the basic types of negative thinking: All-or-nothing, Focusing on the negatives, Catastrophizing, Negative self-labelling, Excessive need for approval, Mind reading, Should statements. I was self-labeling and focusing on the negatives. I was mind-reading that people dislike me. I can hear the voice of my parent saying that I’m a failure and that I’ll never amount to anything. I don't have to be perfect. Nobody is. I have some strengths that people appreciate. I want to get rid of this negative thinking. I feel better when I am kind to myself. Everybody makes mistakes. Be kind to yourself. Before I go into a social setting, I will remind myself that being hard on myself is boring. If I make a mistake, I won't dwell on the negatives. I will remind myself of my past successes. I will remember to be kind to myself and others. If you write a thought record every day for a month, you will begin to see the recurring themes in your automatic thoughts and where they take you. It will also be easier for you to spot your negative thinking and quickly come up with healthy alternatives. How Effective is Cognitive Behavioral Therapy? Cognitive behavioral therapy has been proven to be more effective than other forms of psychotherapy for anxiety and depression. A review of recent variants of cognitive behavioral therapy, including mindfulness-based cognitive therapy, acceptance therapy, and commitment therapy, has shown that they are no more effective than CBT, and that they work through the same underlying mechanisms. The principles of cognitive behavioral therapy are so sound that it can be used effectively in a number of settings. Cognitive behavioral therapy has been shown to be effective when delivered in primary care, via computer, and through internet-based self-help programs. CBT is really two forms of therapy: cognitive and behavioral therapy. Behavioral therapy is sometimes used initially with individuals who are too anxious or too depressed to even acknowledge that their thinking is part of the problem. Behavioral therapy encourages you to try simple tasks, and as you succeed, you gradually improve your belief in yourself. Once you see that you can change your behavior, you may be more willing to change your thinking. In most cases, individuals who are ready to change are encouraged to start directly with cognitive therapy rather than begin with behavioral therapy. In the 1950s, American psychologist Albert Ellis introduced Rational Therapy in which people were taught the A-B-C-D approach for dealing with uncomfortable situations. When a person is confronted with an adversity A, their beliefs B, will influence the way they respond to that adversity and lead to emotional and behavioral consequences C.
If the beliefs B, are rigid, absolute, and unrealistic, the consequences C, will likely be self-defeating and destructive. If the beliefs B, are flexible and constructive, the consequences C, will likely be positive. People can change their thinking and their lives by D, disputing and challenging their beliefs. Rational therapy was partly developed as a reaction to psychoanalysis, which was considered inefficient because individuals went through years of therapy but were not explicitly directed to change their thinking. Psychoanalysis was based on the approach that understanding your subconscious thoughts would eventually lead to self-change. Rational therapy takes a more directive approach. You are encouraged to challenge your beliefs in order to achieve faster and more efficient change. In the 1960s, American psychiatrist Aaron T. Beck introduced Cognitive Behavioral Therapy partly based on the ideas of Albert Ellis and used it as a treatment for depression. Beck developed the idea of the thought record, in which individuals could challenge their thinking through writing their thoughts down and looking for healthier ways of thinking. He also developed self-reporting measures for anxiety and depression including the Beck Anxiety Inventory (BAI) and the Beck Depression Inventory (BDI). The thought record was originally developed by Dr. A. Beck. The traditional thought record uses a column format. This is the format also used in the books “Feeling Good” and “Mind over Mood.” You write your thoughts on specially lined paper within columns. There are usually five or six columns representing five or six questions per thought record. The CBT worksheet uses a journal format, where each step starts a new line. The obvious advantage is that there is more room for questions and you have more room to write. This helps you look deeper and make deeper changes. Hofmann, S. G., Asnaani, A., Vonk, I. J., Sawyer, A. T., et al., The Efficacy of Cognitive Behavioral Therapy: A Review of Meta-analyses. Cognit Ther Res, 2012. 36(5): p. 427-40. PMC3584580. Driessen, E., & Hollon, S. D., Cognitive behavioral therapy for mood disorders: efficacy, moderators and mediators. Psychiatr Clin North Am, 2010. 33(3): p. 537-55. PMC2933381. Kahneman, Daniel, Thinking, Fast and Slow: Farrar, Straus and Giroux, 2013. Tolin, D. F., Is cognitive-behavioral therapy more effective than other therapies? A meta-analytic review. Clin Psychol Rev, 2010. 30(6): p. 710-20. Brooks, S. J., & Stein, D. J., A systematic review of the neural bases of psychotherapy for anxiety and related disorders. Dialogues Clin Neurosci, 2015. 17(3): p. 261-79. PMC4610611. Porto, P. R., Oliveira, L., Mari, J., Volchan, E., et al., Does cognitive behavioral therapy change the brain? A systematic review of neuroimaging in anxiety disorders. J Neuropsychiatry Clin Neurosci, 2009. 21(2): p. 114-25. Paquette, V., Levesque, J., Mensour, B., Leroux, J. M., et al., "Change the mind and you change the brain": effects of cognitive-behavioral therapy on the neural correlates of spider phobia. Neuroimage, 2003. 18(2): p. 401-9. Beutel, M. E., Stark, R., Pan, H., Silbersweig, D., et al., Changes of brain activation pre- post short-term psychodynamic inpatient psychotherapy: an fMRI study of panic disorder patients. Psychiatry Res, 2010. 184(2): p. 96-104. Linden, D. E., How psychotherapy changes the brain--the contribution of functional neuroimaging. Mol Psychiatry, 2006. 11(6): p. 528-38. Hofmann, S. G., Sawyer, A. T., & Fang, A., The empirical status of the "new wave" of cognitive behavioral therapy. Psychiatr Clin North Am, 2010. 33(3): p. 701-10. PMC2898899. Hoifodt, R. S., Strom, C., Kolstrup, N., Eisemann, M., et al., Effectiveness of cognitive behavioural therapy in primary health care: a review. Fam Pract, 2011. 28(5): p. 489-504.